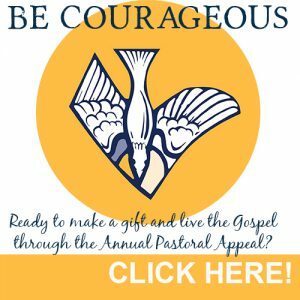 BE COURAGEOUS Live the Gospel through the Annual Pastoral Appeal. 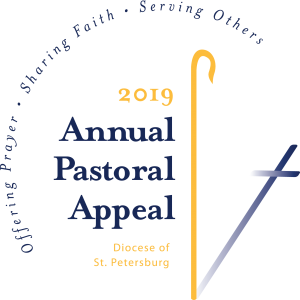 Everyone is asked to join Bishop Parkes and all parishes and missions throughout our diocese in making a pledge or gift for the benefit of each parish, and more importantly, for the many in need throughout the five counties of our diocese. Every gift is valuable. Sometimes it is hard to envision how one gift could make a difference in an organization the size of our diocese, but it does. Every Catholic in every parish, when united, can advance the mission of Christ, loving and serving one another. In times of change and transition, our gifts from God may be more difficult to identify; but we must remember God blesses each of us every day and there is no limit to His mercy. No one can do everything, but everyone can do something. Our focus is not equal gift, but equal sacrifice. BE COURAGEOUS and transform someone’s life. Thank you in advance for continuing to support our parish and our diocesan faith family in so many ways.